, the second son of the preceding, and a very distinguished writer, was born in Ireland, we know not in what year; and admitted a fellow-commoner in Dublin college in 1664, where he continued till he commenced M. A. In 1671, on the death of his father, he came to England and entered himself in the Temple at London, where he studied the law for some years; but | afterwards relinquished it, and applied himself to divinity. In 1680 he was admitted into holy orders; and in 1687 became chancellor of the cathedral-church or diocese of Connor. About this time he rendered himself particularly obnoxious to the Popish party in Ireland, by his zealous opposition to them, which was thus called forth. Roger Boyle, bishop of Clogher, dying in 1687, Patrick Tyrrel was made titular popish bishop, and had the revenues of the see assigned him by king James. He set up a convent of friars in Monaghan; and, fixing his habitation there, held a public visitation of his clergy with great solemnity; when, some subtle logicians attending him, he ventured to challenge the protestant clergy to a public disputation. Leslie accepted the challenge, and disputed to the satisfaction of the protestants; though it happened, as it generally does at such contests, that both sides claimed the victory. 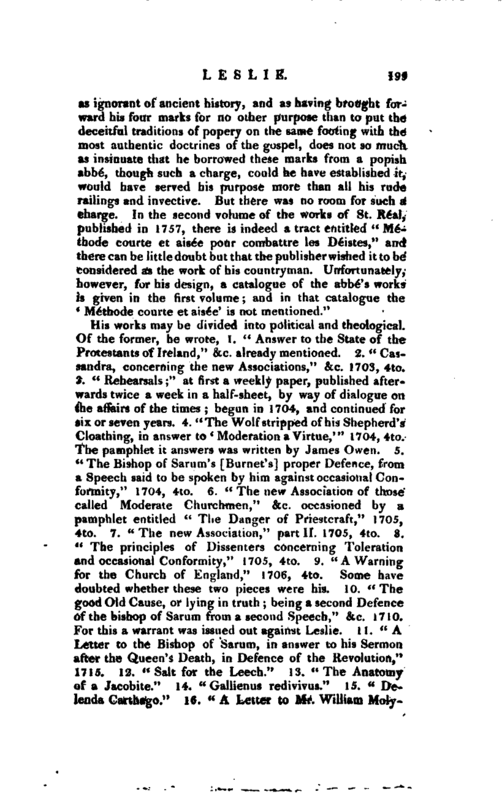 He afterwards held another public disputation with two celebrated popish divines in the church of Tynan, in the diocese of Armagh, before a very numerous assembly of persons of both religions; the issue of which was, that Mr. John Stewart, a popish gentleman, solemnly renounced the errors of the church of Rome. As the papists had got possession of an episcopal see, they engrossed other offices too; and a popish high-sheriff was appointed for the county of Monaghan. This proceeding alarmed the gentlemen in that country; who, depending much on Leslie’s knowledge as a justice of peace, repaired to him, then confined by the gout to his house. He told them, that it would be as illegal in them to permit the sheriff to act, as it would be in him to attempt it. But they insisted that himself should appear in person on the bench, at the approaching quarter-sessions, and all promised to act as he did; so he was carried there with much difficulty, and in great pain. 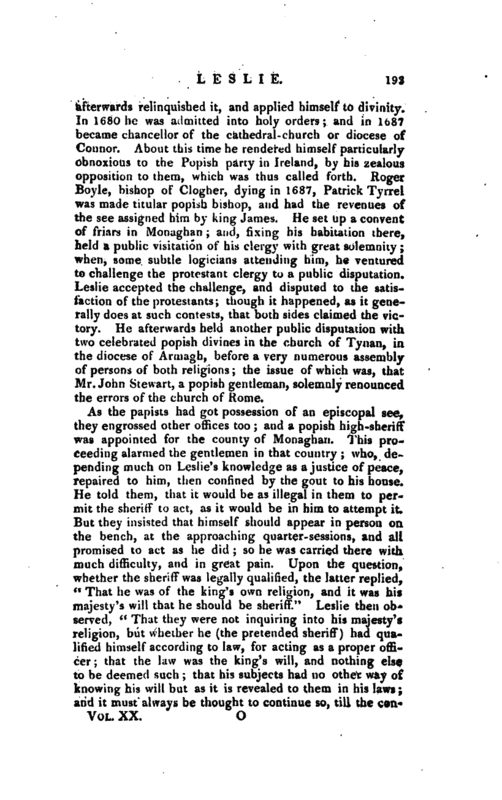 Upon the question, whether the sheriff was legally qualified, the latter replied, “That he was of the king’s own religion, and it was his majesty’s will that he should be sheriff.” Leslie then observed, “That they were not inquiring into his majesty’s religion, but whether he (the pretended sheriff) had qualified himself according to law, for acting as a proper officer; that the law was the king’s will, and nothing else to be deemed such; that his subjects had no other way of knowing his will but as it is revealed to them in his laws; and it must always be thought to continue so, till the carv* | trary is notified to them in the same authentic manner.” This argument was so convincing, that the bench unanimously agreed to commit the sheriff for his intrusion and arrogant contempt of the court. Leslie also committed gome officers of that tumultuous army which the lord Tyrconnel raised, for robbing the country. These last positions have been contested in some respects by an able writer, who thus expresses his opinion “That he (Leslie) repaired to Bar le Due, and endeavoured to convert to the church of England him whom he considered as the rightful sovereign of England, is indeed true; but we have reason to believe that this was not in consequence of his being obliged to leave the kingdom. 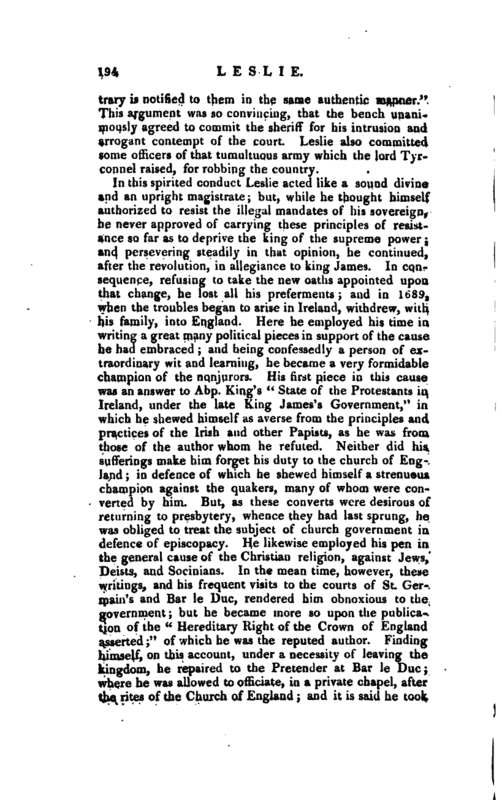 There is, in the first place, some grounds to believe, that ‘The Hereditary Right of the Crown of England asserted’ was not written by him; and there is still in existence undoubted evidence, that in consequence of his great fame as a polemic, he was sent to Bar le Due for the express purpose of endeavouring to convert the son of James II. by some gentlemen of fortune in England, who wished to see that prince on the throne of his ancestors. 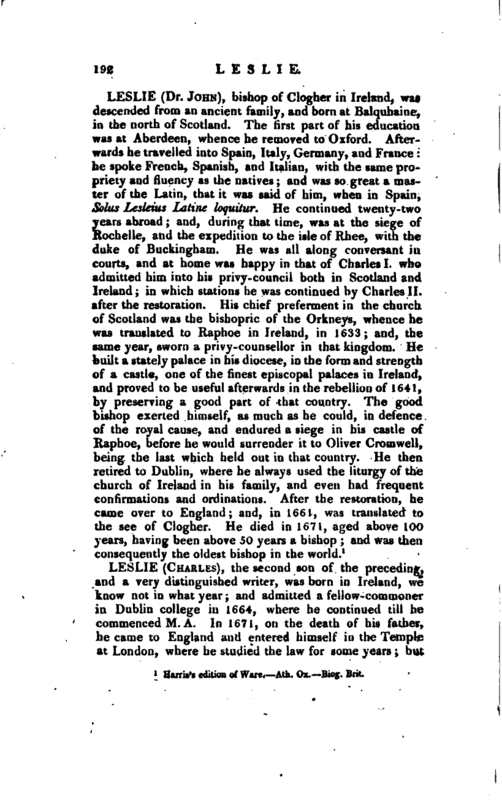 The writer of this article had the honour sixteen or seventeen years ugo, to be known to the grand-daugh ter of one of those gentlemen, a lady of the strictest veracil y; and from her he received many anecdotes of Leslie and his associates, which, as he did qnot then foresee that he should have the present occasion for them, he has suffered to slip from his memory. That lady is still alive, and we have reason to believe is in possession of many let* ters by Leslie, written in confidence to her grandfather, both from Bar le Due, and from St. Germain’s; and by the account which she gave of these letters, Leslie appears to have considered his prince as a weak and incorrigible bigot, though in every thing but religion an amiable and aecoinplished man.” Dr. Gleig’s Supplement to ttie Encyclopaedia Britannica. To this we may add, that the real author of the “Hereditary Right,” &c. wastheRev.Mr. Harbin, alsoa nonjuror, according to a ms note of the late Mr. Whiston’s in his copy of the first edition of this Dictionary. | of the rebels, and in the Pretender’s being obliged to leave the French dominions. In this exigence he withdrew to Italy, whither Leslie attended him, notwithstanding the ill-usage he met with at that court. The Pretender had given him a promise that he should celebrate the church of England service in his family; and that he would hear what he should represent to him on the subject of religion. But the Chevalier was far from keeping the word he had given, and on the faith of which our divine had come over; for, though he allowed him, for form’s sake, to celebrate the church of England service in his family, yet he never was present there; and not only refused to hear Leslie himself, but sheltered the ignorance of his priests, or the badness of his cause, or both, behind his authority, and absolutely forbad all discourse concerning religion. However, Leslie put up with every thing, in dutiful submission to his avowed sovereign, till 1721, when he returned to England, resolving, whatever the consequences might be, to die in his own country. 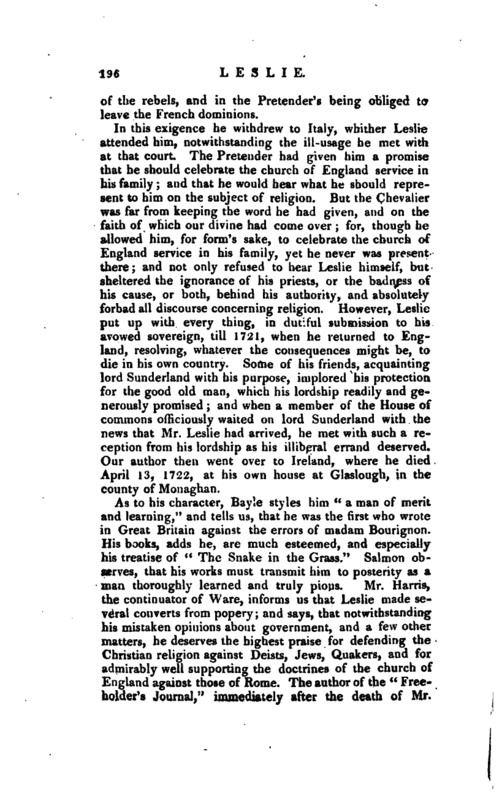 Some of his friends, acquainting lord Sunderland with his purpose, implored his protection for the good old man, which his lordship readily and generously promised; and when a member of the House of commons officiously waited on lord Sunderland with the news that Mr. Leslie had arrived, he met with such a reception from his lordship as his illiberal errand deserved. Our author then went over to Ireland, where he died April 13,‘ 1722, at his own house at Glaslough, in the county of Monaghan. As to his character, Bayle styles him “a man of merit and learning,” and tellsus, that he was the first who wrote in Great Britain against the errors of madam Bourignon. His books, adds he, are much esteemed, and especially his treatise of “The Snake in the Grass.” Salmon observes, that his works must transmit him to posterity as a man thoroughly learned and truly pious. Mr. Harris, the continuator of Ware, informs us that Leslie made several converts from popery; and says, that notwithstanding his mistaken opinions about government, and a few other matters, he deserves the highest praise for defending the Christian religion against Deists, Jews, Quakers, and for admirably well supporting the doctrines of the church of England against those of Rome. 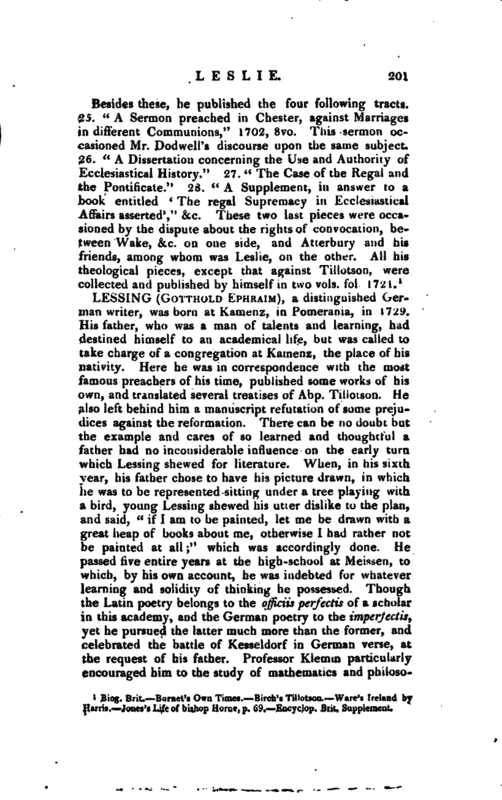 The author of the “Freeholder’s Journal/’ immediately after the death of Mr, | Leslie, observed, that when the popish emissaries were most active in poisoning the minds of the people, Mr. Leslie was equally vigilant in exposing, both in public and private, the errors and absurdities of the Romish doctrines. Yet, upon the abdication of king James, he resigned his livings, followed his fortunes, and adhered firmly to his interests; and, after his demise, to those of the Pretender. Notwithstanding his well-known attachment to the Jacobite interest, and, his frequent visits to the court of St. Germain’s, he was not much molested by the government till a little before Sacheverell’s trial, when he attacked Bp. 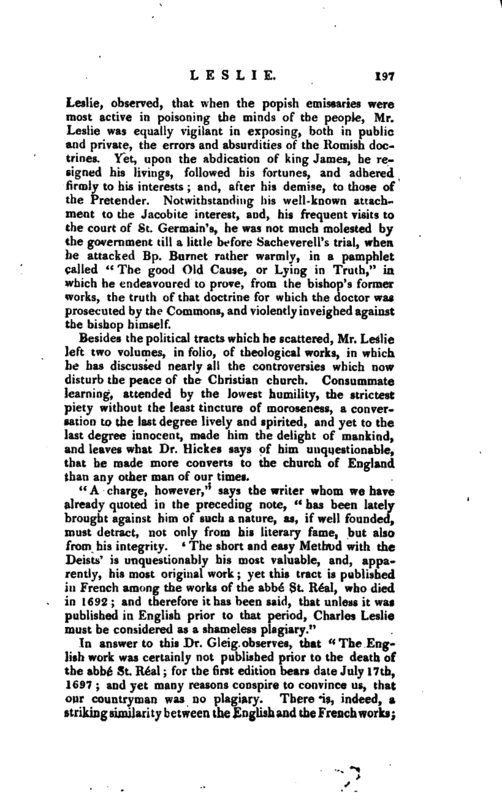 Burnet rather warmly, in a pamphlet called” The good Old Cause, or Lying in Truth," in which he endeavoured to prove, from the bishop’s former works, the truth of that doctrine for which the doctor was prosecuted by the Commons, and violently inveighed against the bishop himself. Besides the political tracts which he scattered, Mr. Leslie left two volumes, in folio, of theological works, in which he has discussed nearly all the controversies which now disturb the peace of the Christian church. Consummate learning, attended by the lowest humility, the strictest piety without the least tincture of moroseness, a conversation to the last degree lively and spirited, and yet to the last degree innocent, made him the delight of mankind, and leaves what Dr. Hickes says of him unquestionable, that he made more converts to the church of England than any other man of our times. 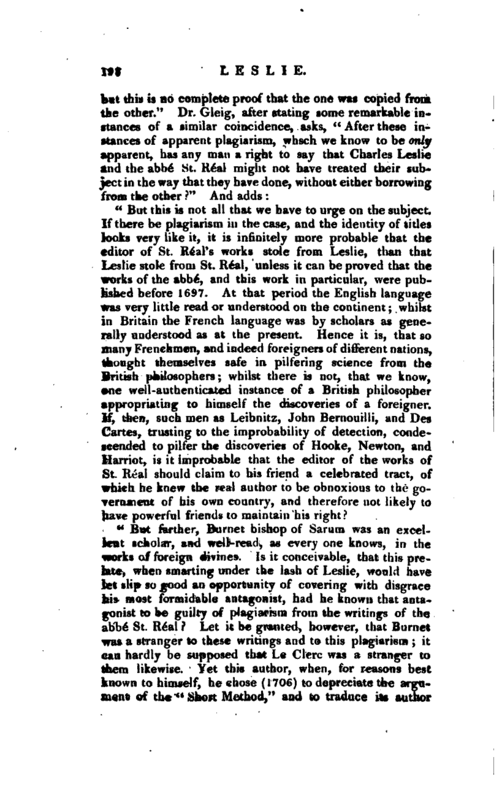 "But this is not all that we have to urge on the subject If there be plagiarism in the case, and the identity of titles looks very like it, it is infinitely more probable that the editor of St. Real’s works stole from Leslie, than that Leslie stole from St. Réal, unless it can be proved that the works of the abbe*, and this work in particular, were published before 1697. At that period the English language was very little read or understood on the continent; whilst in Britain the French language was by scholars as generally understood as at the present. Hence it is, that so many Frenchmen, and indeed foreigners of different nations, thought themselves safe in pilfering science from the British philosophers; whilst there is not, that we know, one well-authenticated instance of a British philosopher appropriating to himself the discoveries of a foreigner. If, then, such men as Leibnitz, John Bernouilli, and Des Cartes, trusting to the improbability of detection, condescended to pilfer the discoveries of Hooke, Newton, and Harriot, is it improbable that the editor of the works of St. Real should claim to his friend a celebrated tract, of which he knew the real author to be obnoxious to the government of his own country, and therefore not likely to have powerful friends to maintain his right? His works may be divided into political and theological. Of the former, he wrote, I. “Answer to the State of the Protestants of Ireland,” &c. already mentioned. 2. “Cassandra, concerning the new Associations,” &c. 1703, 4to. 3. “Rehearsals;” at first a weekly paper, published afterwards twice a week in a half-sheet, by way of dialogue on the affairs of the times; begun in 1704, and continued for six or seven years. 4. “The Wolf stripped of his Shepherd’s Cloathing, in answer to * Moderation a Virtue,’” 1704, 4to. The pamphlet it answers was written by James Owen. 5. “The Bishop of Sarum’s [Burnet’s] proper Defence, from a Speech said to be spoken by him against occasional Conformity,” 1704, 4to. 6. “The new Association of those called Moderate Churchmen,” &c. occasioned by a pamphlet entitled “The Danger of Priestcraft,” 1705, 4to. 7. “The new Association,” part II. 1705, 4to. 8. “The principles of Dissenters concerning Toleration, and occasional Conformity,” 1705, 4to. 9. “A Warning for the Church of England,” 1706, 4to. Some have doubted whether these two pieces were his. 10. “The good Old Cause, or lying in truth; being a second Defence of the bishop of Sarum from a second Speech,” &c. 1710. For this a warrant was issued out against Leslie. 11. “A Letter to the Bishop of Sarum, in answer to his Sermon after the Queen’s Death, in Defence of the Revolution,” 1715. 12. “Salt for the Leech.” 13. “The Anatomy of a Jacobite.” 14. “Gallienus redivivus.” 15. “Delenda Carthago.” 16. A Letter to Mr. William | Molyneux, on his Case of Ireland’s being bound by the English Acts of Parliament.“17.” A Letter to Julian John* son." 18. Several Tracts against Dr. Higden and Mr, Hoadly. His theological tracts are, first, against the Quakers; as, 1. ‘ The Snake in the Grass,“&c. 1697, 8vo. 2.” A Discourse proving the Divine Institution of Water Baptism,“&c. ibid. 4to. 3.” Some seasonable Reflections upon the Quakers’ solemn Protestation against George Keith,“&c. 1697. 4.” Satan disrobed from his Disguise of Light,“1698, 4to. 5.” A Defence of a book entitled ‘The Snake in the Grass,’ 1700,“8vo. 6.; A Reply to a book entitled” Angnis rlagellatus, or a Switch for the Snake being the last part of the Snake in the Grass,“1702, 8vo. 7.” Primitive Heresy revived in the Faith and Practice of the Quakers,“1698, 4to. 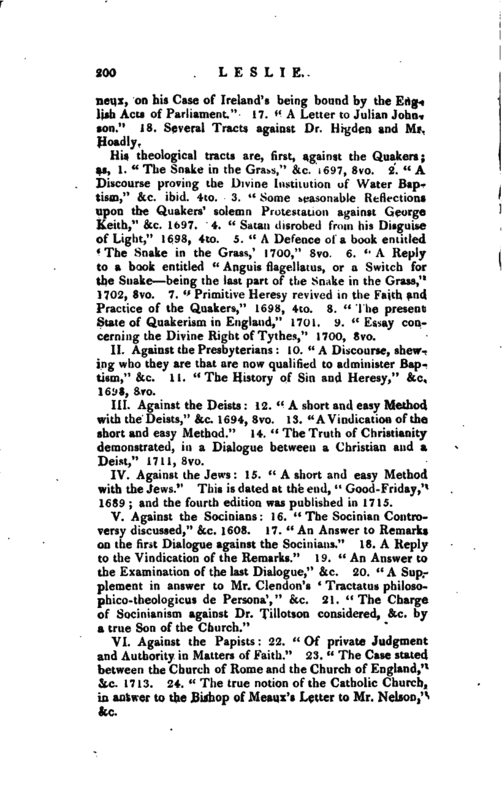 8.” The present; State of Quakerism in England,“1701. 9.” Essay concerning the Divine Right of Tythes," 1700, 8vo. II. Against the Presbyterians: 10. “A Discourse, shevring who they are that are now qualified to administer Baptism,” &c. 11. “The History of Sin and Heresy,” &c. 1698, 8vo. III. Against the Deists: 12. “A short and easy Method with the Deists,” &c. 1694, 8vo. 13. “A Vindication of the short and easy Method.” 14. “The Truth of Christianity demonstrated, in a Dialogue between a Christian and a Deist,” 1711, 8vo. IV. Against the Jews: 15. “A short and easy Method with the Jews. *’ This is dated at the end,” Good-Friday," 1689; and the fourth edition was published in 1715. V. Against the Socinians: 16. “The Socinian Controversy discussed,” &c. 1608. 17. “An Answer to Remarks on the first Dialogue against the Socinians.” 18. A Reply to the Vindication of the Remarks.“19.” An Answer to the Examination of the last Dialogue,“&c. 20.” A Supplement in answer to Mr. Clendon’s * Tractatus philosophico-theologicus de Persona‘,“&c. 21.” The Charge of Socinianism against Dr. Tillotson considered, &c. by a true Son of the Church." VI. Against the Papists: 22. “Of private Judgment and Authority in Matters of Faith.” 23. 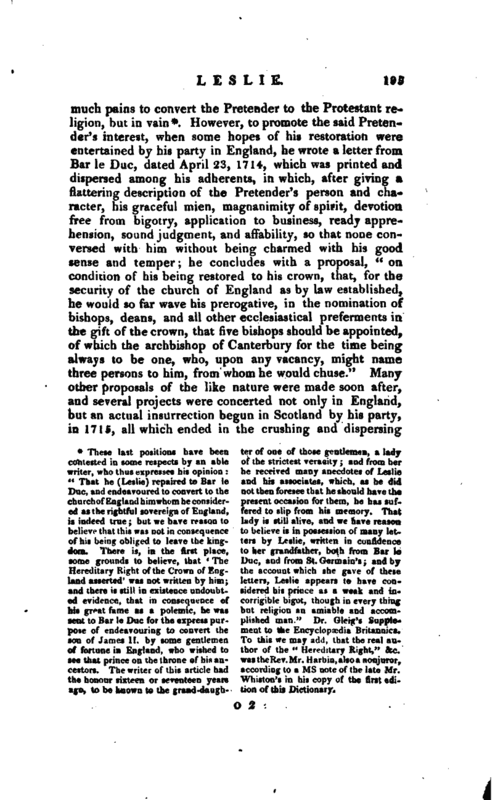 “The Case stated between the Church of Rome and the Church of England,” &c. 1713. 24. “The true notion of the Catholic Church, in answer to the Bishop of Meaux’s Letter to Mr. Nelson,” Ice. | Besicks these, be published the four following tracts. 25. “A Sermon preached in Chester, against Marriages in different Communions,” 1702, 8vo. This sermon occasioned Mr. Dod well’s discourse upon the same subject. Biog. Brijt. Burnet’s Own Times. Birch’s Tillotson. Ware’s Ireland by Harris.r-Jones’8 Life of bishop Home, p, 69. Encyclop. Brit, Supplement.